This poster illustrates the main components in a unicast IPv6 address and some interesting facts about it. To help design your IPv6 addressing plan, make sure you download our IP Address Calculator. Network service providers (a.k.a communication carriers) are offering multiple services suitable for MAN (metropolitan area network) and WAN (wide area network) connectivity. This article introduces two of these services that offer unique benefits to organizations seeking this type of network connectivity. Dark fibre refers to optical fibre cables that have been installed underground or over utility poles but are not being utilized yet. Since these cables offer a medium for light to transfer data, dark fibre refers to the ‘unlit’ strands of fibre. Network service providers offer dark fibre service by leasing these strands of fibre to organizations seeking a point-to-point connectivity solution that provides secure high speed data transport. The organization that acquires Dark Fibre service can take full control of the connection including the choice of the transmission technology (Ethernet, ATM, Fibre-channel or any other widely adopted protocol). Dark Fibre also provides virtually unlimited amount of bandwidth since a single fibre strand can carry up to 100Gbps of data, and with the use of WDM (wavelength division multiplexing) technologies the amount of available bandwidth can be multiplied. Dark Fibre circuits are not routed or tunnelled across the public Internet or any other infrastructure. And, as only one customer is utilizing the Dark Fibre circuit, they are very secure way to connect mission critical sites. Such service is often backed by a comprehensive SLA that guarantees service up-time and timely service restoration. The service provider may offer the organization to select the route it wants to connect its sites as well as adding physically diverse optical paths for added reliability. Almost every aspect of performance can be controlled by the organization that uses the Dark Fibre service. Since no electronics exist on the light path, latency is limited only by the propagation delay of light in the fibre. Jitter and processing delays are also controlled by the organization by choosing the proper active network components at fibre terminating ends. Dark Fibre service does not have to be limited to point-to-point connectivity. Multiple services can be acquired from the service provider to build any desired topology enabling the organization to create and manage its network without the need to invest in building its own fibre infrastructure. 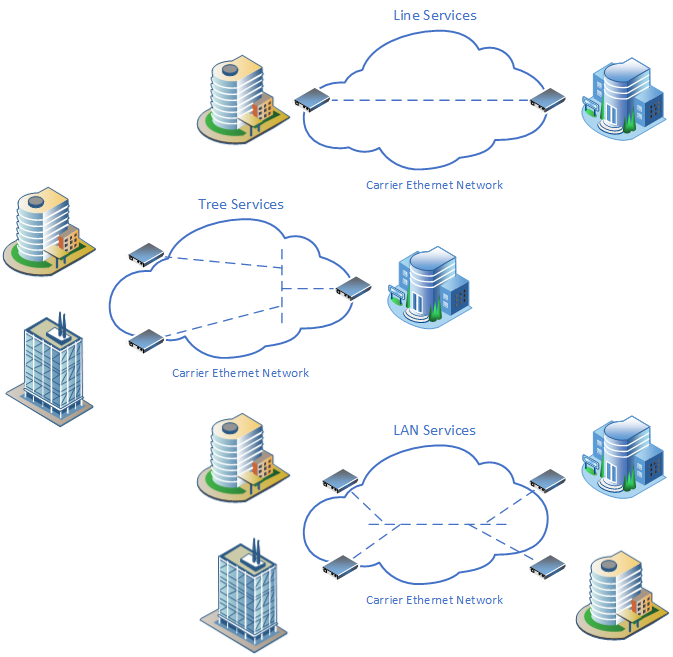 Carrier Ethernet refers to extensions to the Ethernet technology that allow a service provider (Carrier) to offer customers point-to-point or multipoint-to-multipoint Ethernet Virtual Connections (EVCs) over the provider’s backbone network. Defined by standards from organizations such as the IEEE and the MEF, this technology allows an organization to connect two or more sites transparently over the Carrier’s network without being exposed to other customers on the network. The technology also ensures the Carrier’s network is isolated from the customer’s network and not affected by the common characteristics of Ethernet LANs, such as frame broadcasts and spanning-tree convergence. The psychical demarcation point between the customer and Carrier networks is known as the User Network Interface (UNI). The Carrier Ethernet specifications define services that carry data from UNI to UNI. The latest Carrier Ethernet specifications, CE2.0, includes four service types (E-Line, E-LAN, E-Tree, and E-Access). Furthermore, each service type can be either Port or VLAN based, resulting in a total of eight services. The CE2.0 dedicates the E-Access service type to interconnections between service providers at the External Network-Network Interface (ENNI). Offered under different marketing names, Carrier Ethernet services enable the customer organization to connect multiple locations using point-to-point (Line), multipoint-to-multipoint (LAN) or point-to-multipoint (Tree) topologies using virtually no additional equipment. Thus, no capital costs are incurred to build the inter-site network connectivity. From the customer’s network point-of-view the EVCS are transparent links, which can transport data traffic from multiple VLANS or event Layer 2 protocol frames. Since the services utilize the carrier’s backbone, the organization topology may extend to any point in the carrier’s network regardless of physical distances, making the services ideal for wide geographical reach. Service parameters such as bandwidth, up-time, jitter, and latency are determined by service options and providers SLA with the ability to upgrade to higher performance level if the need arise. We described briefly two network services commonly available from major carriers. An organization can acquire either one of these services to fulfill its WAN connectivity requirements and other business requirements. We conclude this article with a summary of the main features of each service in Table 1. Customer is responsible managing active components Carrier is responsible for managing the service to the demarcation point.